McMartin House Membership is required. One $20 Annual Membership Fee permits a member to join any number of activities. Most activities have small charges each session to cover supplies, resources, refreshments etc. TAY COMMONS COHOUSING – The Tay Commons Cohousing group meets the first Thursday of every month at 6 p.m. with the purpose of developing a cohousing community within walking distance of downtown Perth. In cohousing, each individual or couple enjoys the privacy of a self-contained dwelling within a life-enhancing community – where people know their neighbours well, share conversations, activities, amenities and occasional meals. Members of a cohousing community share values of respectful collaboration, mutual support, diversity, energy efficiency and sustainability. Cohousing in Perth is being developed, shaped physically, socially and financially through the active participation of the people who will live there. For more information, please go to http://www.perth-cohousing-initiative.com or call Louise McDiarmid 613-264-8590 or Susan Samila 613-264-1196. 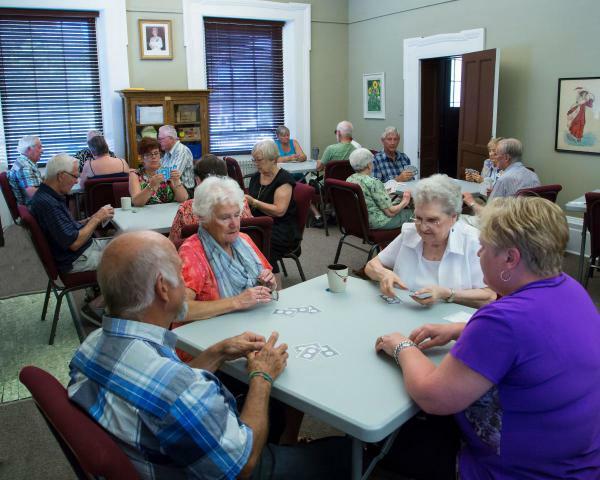 THE FRIDAY AFTERNOON BRIDGE CLUB - meets in the Edna Green Room at McMartin House every Friday afternoon, officially starting at 12:30 P.M., to play social Bridge in a comfortable and friendly setting. In fact, many members like to get there an hour or two early and play Bridge with friends prior to the formal four hand bridge game competitions that start at 12:30. There are five rounds of four-hand Bridge, with scores recorded for each individual and their partners at each table. The winners at each table rotate to the next table. There are small prizes for the persons with the highest individual score, the second highest, and the lowest. Prizes are also awarded for the overall winner for the year. Kveta Privora and Joy Price, Activity Directors, report that the Friday afternoon Bridge group normally averages 5 or 6 tables of Bridge, and is growing with new members who join after attending “Teaching Bridge” sessions. Members contribute $2.00 each Friday they play Bridge, to cover refreshments provided each session and the purchase of playing cards and supplies. These funds also cover an annual donation the group makes to McMartin House. Contact: Kveta Privora at 613-300-9502. TEACHING BRIDGE - “Teaching Bridge” sessions are offered periodically rather than continuously. When there is sufficient demand, sessions may be offered in the January to March period, each year. The goal of these sessions is to teach the fundamentals of Bridge while allowing players to gain experience in a friendly, informal and mentored environment. Those attending range from complete newcomers with no knowledge of Bridge to individuals with a pretty fair knowledge of how to bid and play, but who wish to gain more experience playing with experienced players who are willing to be helpful. 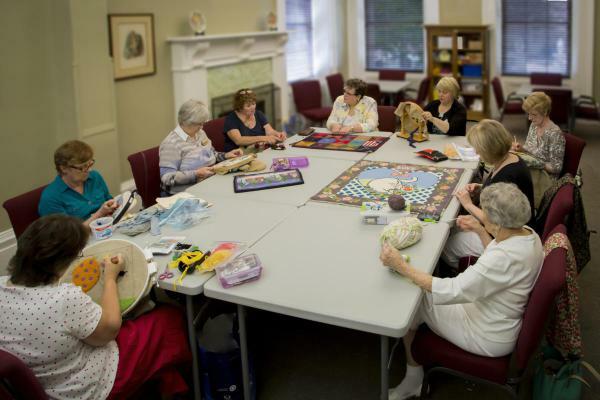 THE FRIENDSHIP GROUP - The Friendship Group meets on Wednesday afternoons [1:30-3:30 P.M.] with the objective of learning crafts from each other in an informal, friendly social setting. Activity Director Sheila Marjoram reports that the group believes that friendship and fun are essential to learning and make important contributions to personal health. Newcomers are welcome to join the group and learn a craft of their choice while making new friends! Contact Sheila Marjoram at 613-267-2700. LINE DANCING - The Line Dancing Group is a well-established group with an enthusiastic membership of up to three dozen dancers, with the number declining a bit when their snowbirds depart for the sunny south. Line dancing sessions begin each year on the Monday after Thanksgiving mid-late October (Check the Events Calendar) and run each Monday (except holidays) through to about the last week in March. Class sessions run from 9:30 to 10:30 A.M. (Beginners' Group) and from 10:45 to 11:45 A.M. (Intermediate Group). Classes are $3.00 each. This activity emphasizes the great value of Line Dancing to the health of the dancers. It is “good for the body and the memory. It adds years to your life, and life to your years!” The music and dances that the leaders use with the group include the waltz, cha—cha, polka, samba, and rhumba as well as country and western. New members are welcome. SCOTTISH COUNTRY DANCING Scottish Country Dancers meet every Friday morning (from 9:30 to 11:30 A.M.) to learn new dances and have fun. Simone Crabb of Perth and Tony French of Maberly, experienced dancers, generously donate their time to prepare and teach the programs. 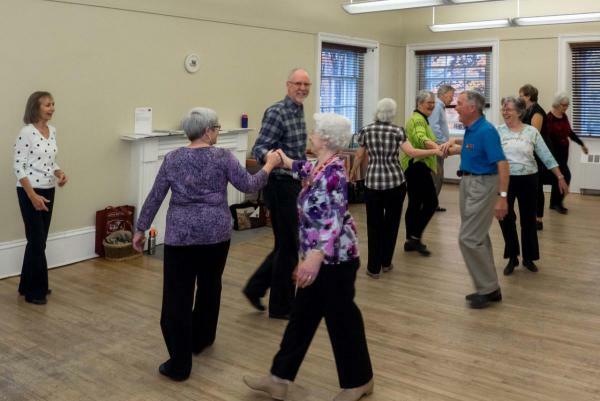 Simone and Tony have been part of the Brockville Scottish Country Dance Group for years, and have also danced in several areas, including Ottawa, Black's Corners and Watson's Corners. Scottish Country Dancing is done to lively jigs and reels, or to slower strathspeys. Since the dancing is done in soft dance shoes or dance slippers, the group meets in the upstairs boardroom at McMartin House with its beautiful hardwood flooring. Our members are a happy, easygoing group, able to laugh at their own mistakes, or to appreciate the beauty in a dance well performed by all. Scottish Dancing is also a fun way to exercise the brain, the toes and everything in between. THE STAMP CLUB - Perth’s Stamp Club, which meets at McMartin House the 2nd and 4th Wednesday of each month, has been operating for 22 years. An attendance record is kept, and those present pay a $1.00 fee, which is used for club expenses. Every meeting, a member makes a presentation on a part of their collection which is of interest to the other members. YOGA - Wikipedia defines Yoga as the physical, mental, and spiritual practices which originated in ancient India as systems helping the individual to attain a state of permanent peace. Since the 1980s, yoga has been popular as a system of physical exercise contributing to fitness. The gentle Yoga courses offered at McMartin House encourage stretching and body movement through basic postures. They offer adapted postures and the use of props and other aids to allow all senior students to participate as they feel they are able. Jill Dunkley leads one McMartin House group in selected exercises every Tuesday afternoon from 2:00 to 3:30 P.M. and Nancy Williams leads another every Thursday from 10 to 11:30 A.M. The Level 1 Thursday Class does not do yoga “on our hands and knees”. The chair is an option for part or all of this class. Contact info@yogaconnectionperth.org or phone 613-267-7148. TRADITIONAL RUG HOOKING - Marie Amyot, Activity Director, reports that the 3H club, the “Honourable Hometown Hookers”, has been meeting since November, 2011. They meet every Tuesday afternoon in the Yoga Room at McMartin House, from 1:00 to 4:00. One of the members is an OHCG (Ontario Hooking Craft Guild) teacher who offers classes (beginner, playing with plaids, Celtic design, folk art design, fine shading, and more). Hooked rugs made by the 3H Perth rug hookers have been on display in several locales, including the 2013 Quilts on the Tay Show held at St. John Catholic High School. New Members are welcome. Contact Marie Amyot, 613-267-1715. THE WEDNESDAY MORNING BOOK CLUBS - Some people play Bridge or Euchre for intellectual stimulation and social interaction. Others learn crafts with a craft club (for the same reasons). Still others find the same sorts of satisfaction in a book club. “There are many different types of book clubs, but they all have the same goal: To read, discuss, and learn from a book”. 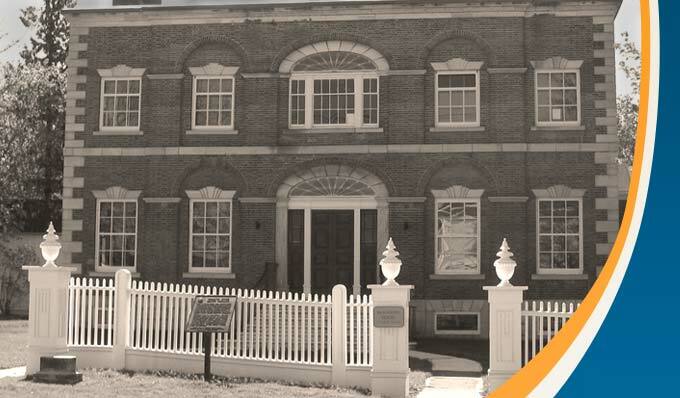 McMartin House hosts two different groups, one which meets the first Wednesday Morning of the month from 10:00 A.M. to 12:00 noon, BookClubW1 (directed by Doris Coates) and one that meets on the 2nd and 4th Wednesdays from 9:30 to 11:30, BookClubW2&4 directed by Ruth Craig. Ruth Craig, Activity Director for BookClubW2&4, reports that the 2nd and 4th Wednesday Book Club has been meeting each month from September until May for nearly thirty years. Members discuss one book each meeting. Shirley Patterson, a club member, notes that “their choices are usually, but not always, fictional, and discussion is lively and contentious”. Newcomers are welcome. Contact Ruth Craig at (613) 264-8442.